Performing various cutting or grinding operations on a piece of work. industrial processes of metalworking by chip removal; performed by cutters on metalcutting machine tools to impart the required shape, dimensions, and surface finish to metal parts. The basic varieties of machining are turning, planing, drilling, reaming, broaching, milling and gear-cutting, grinding, and honing. The principles of machining are regarded as the result of interactions in the machine-attachment-tool-workpiece system. Among the Russian and Soviet scientists who have made major contributions to the development of the foundations of the mechanics of cutting processes are I. A. Time, K. A. Zvorykin, A. A. Briks, A. V. Gadolin, la. G. Usachev, A. N. Cheliustkin, I. M. Besprozvannyi, G. I. Granovskii, A. M. Danielian, N. N. Zorev, A. I. Isaev, M. V. Kas’ian, A. I. Kashirin, V. A. Krivoukhov, V. D. Kuznetsov, M. N. Larin, T. N. Loladze, A. Ia. Malkin, A. V. Pankin, N. I. Reznikov, and A. M. Rozenberg. Important contributions have also been made by foreign scientists, among them Merchant and Ernst (USA); W. Degner, R. Reinhold, and N. Jakobs (German Democratic Republic); H. Opitz (Federal Republic of Germany); M. Okoshi (Japan); and E. Skřiván (Czechoslovakia). Important practical contributions have been made by the Soviet workers and innovators G. S. Bortkevich, P. B. Bykov, V. I. Zhirov, V. A. Karasev, V. A. Kolesov, S. I. Bushuev, E. I. Lebedev, and V. K. Seminskii. The chip removed by the cutting tool (cutter, drill bit, broaching tool, or milling cutter) during machining may be of the shearing, continuous, or discontinuous type, depending on the cutting conditions. The type of chip formation and deformation of the metal is usually analyzed for specific cases, depending on the cutting conditions, and also on the chemical composition and physicochemical properties of the metal being machined, the cutting rate, the geometry of the cutting part of the tool, the orientation of the cutting edges relative to the cutting velocity vector, and the lubricant-coolant. The deformation of the metal in various zones of chip formation is different, and it also involves the surface layer of the part being machined, which therefore becomes work-hardened, and internal (residual) stresses arise in it. This affects the quality of the machined parts as a whole. the zones of friction at points of contact of the tool bit with the chip and the part. The focal points affect the resistance of the cutting tool (the operating time to a specified degree of bluntness), as well as the quality of the surface layer of the machined part. 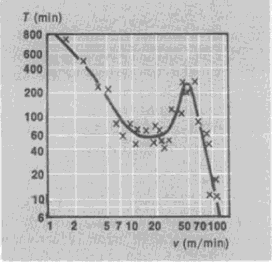 A description of the temperature field in the cutting zone (Figure 2) may be obtained experimentally, by calculation, or by computer simulation of the cutting process. Thermal phenomena in machining cause changes in the structure and physicochemical properties of both the layer of metal that is removed and of the surface layer of the machined part; changes also take place in the structure and hardness of the surface layers of the cutting tool. The process of heat generation also depends on the cutting conditions. 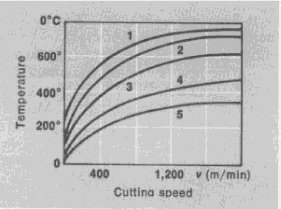 The cutting speed and the properties of the machined metal exert a substantial effect on the cutting temperature in the zone of contact between the chip and the leading edge of the cutting tool (Figure 3). The thermal and temperature factors of machining processes are elucidated by experimental methods of calorimetry, by means of thermocouples, according to changes in the microstructure (for example, of the surface of the tool), and by using thermocolors, optical methods, and radiation techniques. Friction of the chip against the surfaces of the cutting tool, as well as thermal and electrical phenomena during machining, causes wear of the cutting tool. The following types of wear are distinguished: adhesive, abrasive-mechanical, abrasive-chemical, diffusion, and electrodiffusion. One of the main factors determining the selection of the optimum geometry of the cutting part of a metalcutting tool is the nature of wear of the tool. The criterion of wear used in selecting a cutting tool depends on the material of the cutting portion of the tool, as well as other cutting conditions. The nature of wear of the back surface of a cutter is shown in Figure 4. The cutter must be reground after the working time T2 at the wear level hopt (before the onset of critical wear hcrit, which corresponds to T3). where Pz is the component of the cutting force (in newtons, or kilograms-force) in the direction of feed, and ν is the cutting speed (in m/min); the power consumption of the electric motor of the machine tool is Nm = Ne/η, where η is the efficiency of the machine tool. The cutting speed permitted by the cutting tool depends on the same factors as the cutting forces and is related in a complex manner to the tool’s resistance to wear (Figure 5). 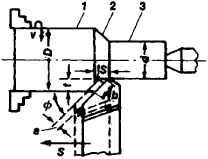 Machining is influenced to a considerable degree by the active lubricant-coolant fluids, which, if correctly selected and properly supplied, are capable of increasing the resistance of the cutting tool, increasing the permissible cutting speed, improving the quality of the surface layer, and decreasing the roughness of the machined surfaces, particularly in the case of parts made from tough heat-resistant and refractory steels and alloys, which are difficult to machine. The forced oscillations (vibrations) of the machine-attachment-tool-workpiece system, as well as self-oscillations of the elements of the system, cause deterioration of the results of machining. Oscillations of either type may be reduced by influencing the factors that cause the oscillations, such as discontinuity of the cutting process, imbalance of rotating parts, defects in the transmission elements of the machine, and insufficient rigidity and deformations of the blank. The efficiency of machining depends on the establishment of efficient cutting rates, taking all pertinent factors into account. Computers are used to speed up calculations. Computation of the cutting rates in computers consists of preliminary selection of input information, development and specification of algorithms, entry of the input information on data cards, coding of information, and programming of algorithms. An increase in labor productivity and a reduction in metal losses (chips) during machining are associated with the increasing use of methods for the fabrication of blanks whose shape and dimensions are as close as possible to those of the finished articles. This leads to a sharp reduction in—or complete elimination of—preliminary (rough-working) operations and to a predominance of finishing operations in machining. Future trends in machining include intensification of cutting processes, introduction of techniques for the processing of new materials, increase of precision and quality of finishing, use of hardening processes, and automation and mechanization. Besprozvannyi, I. M. Osnovy teorii rezaniia metallov. Moscow, 1948. Russkie uchenye—osnovopolozhniki nauki o rezanii metallov: I. A. Time, K. A. Zwrykin, la. G. Usachev, A. N. Cheliustkin. Zhizn’, deiatel’nost’ i izbrannye trudy. Moscow, 1952. Avakov, A. A. Fizicheskie osnovy teorii stoikosti rezhushchikh instrumentov. Moscow, 1960. Pankin, A. V. Obrabotka metallov rezaniem. Moscow, 1961. Razvitie nauki o rezanii metallov. Moscow, 1967. Elektricheskie iavleniia pri trenii i rezanii metallov. Moscow, 1969. Briukhov, V. A., and E. N. Pavlov. Raschet rezhimov rezaniia i normirovanie spomoshch’iu EVM. Moscow, 1969. Roman, O. V., A. A. Leventsov, and I. F. Shelkovskii. Obrabotka metallov rezaniem i stanki. Minsk, 1970. Although various machining operations may appear to be very different, most are very similar&colon; they make chips. These chips vary in size from the long continuous ribbons produced on a lathe to the microfine sludge produced by lapping or grinding. These chips are formed by shearing away the workpiece material by the action of a cutting tool. Cylindrical holes can be produced in a workpiece by drilling, milling, reaming, turning, and electric discharge machining. Rectangular (or nonround) holes and slots may be produced by broaching, electric discharge machining, milling, grinding, and nibbling. Cylinders may be produced on lathes and grinders. Special geometries, such as threads and gears, are produced with special tooling and equipment utilizing the turning and grinding processes mentioned above. Polishing, lapping, and buffing are variants of grinding where a very small amount of stock is removed from the workpiece to produce a high-quality surface. In almost every case, machining accuracy, economics, and production rates are controlled by the careful evaluation and selection of tooling and equipment. Speed of cut, depth of cut, cutting-tool material selection, and machine-tool selection have a tremendous impact on machining. In general, the more rigid and vibration-free a machining tool is, the better it will perform. Jigs and fixtures are often used to support the work-piece. Since it relies on the plastic deformation and shearing of the workpiece by the cutting tool, machining generates heat that must be dissipated before it damages the workpiece or tooling. Coolants, which also acts as lubricants, are often used.